A classic blues head with a driving rhythm, written for drummer Philly Joe Jones. Condensed score, second parts and separate bass part. All rhythm hits included. Our "K.D. Challenge" version has Minus You tracks for all instruments at three different tempos, so you can start slow and work up to full speed. 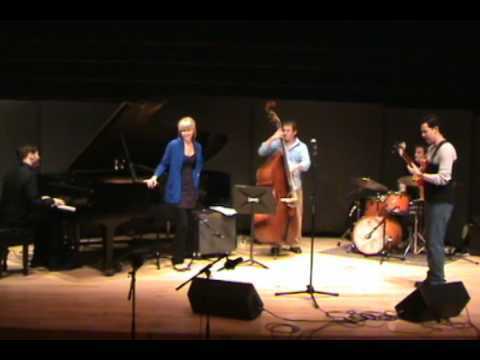 The Flat Five: Ali Enaam, guitar; Naman Wiesel, piano; Josh Dodds, bass; Ben Dodds, drums; live at Oscar Peterson Hall, Montreal, 2009. Charles Levin Quintet: Mike Rocha, trumpet; Frank Silva, tenor sax; Kevin Fukagawa, piano; Emilio Terranova, bass; Charles Levin, drums; live at CalArts, Valencia, California, 2011. Joe Mazzaferro, trumpet; with Jason Thompson, tenor sax; Mike Seal, guitar; Keith Brown, piano; Clint Mullican, bass; Nolan Nevels, drums. Live at University of Tennessee, Knoxville. This is a classic Kenny Dorham blues-plus composition that he wrote for the incredible drummer on the recording, Philly Joe Jones. After the super slick blues head, there is an equally slick ten-measure B section that moves into an eight-measure section featuring the soloist to set up solo blues choruses. The lead sheets include the repeating drum chorus with its horns-against-rhythm-section figures. On the recording, Philly Joe sets up the melody with a four-measure solo. Our audio clip teaser starts with the melody and gives you a taste of the B section. As with so many of K.D. 's compositions, this one needs a separate bass part. The bass part and the C Condensed Score (recommended for pianists and drummers) are the only editions that contain all the specific chord symbols. The other editions (remember, the A section is a blues) contain the melody (or the second part) along with all rhythm hits which are so important to this composition. When the recorded melody is played by trumpet, sometimes the melody goes below the staff. For that reason we'll often write the C lead sheet an octave higher and label it "Guitar," since guitar parts are written an octave higher than they sound. Often this is also the best range for a flute or violin to play the melody. If not, simply play the melody down an octave. Although the dance craze "The Twist," ignited by Chubby Checker, became popular before the first recording of Philly Twist, this song is not named for it, but is rather an homage to drummer Philly Joe Jones. As critic Phil Freeman puts it, "with its relentless, driving rhythm [it] provided a chance for him to rock the kit like only he could." To read more of Phil's article for Blue Note, check their blog post on the album "Whistle Stop." Philly Twist may be played at a medium up tempo, but you'll have to stay extremely focused to get the hits right. Trumpeter/composer Kenny Dorham shows no mercy with these challenging hits, meant to be played in unison by everyone in the group. Once they start walking at the B section, though, you can just swing away on a B-flat blues until the hits are re-introduced for the drum solo. If reading rhythms is something you're trying to solidify, this would be a great one to check out. This is altoist Phil Woods' version of Kenny Dorham's classic blues written for drummer Philly Joe Jones. Woods recorded with both Dorham and Philly Joe in 1956, so this song was a natural for him. Like our Minus You versions, this arrangement of Philly Twist starts with a four-measure drum intro as in Dorham's original "Whistle Stop" version of the song. Check out our drum transcription of Willie Jones III's playing on this track in the Drum Corner tab. On the complete recording you'll hear from Phil Woods and Roy Hargrove who take full solos and trade as well as from pianist Bill Charlap. Woods uses the same ending as on Kenny's original recording, but ends on the sharp 9 instead of on the fifth like on the original and "K.D. Challenge" recordings. Note: the lead sheets available here are the same as the ones on the "Whistle Stop" page. The Willie Jones III Drum Transcription is only found on this page. Legendary alto sax player Phil Woods joins Bill Charlap and his trio for this notable recording which was recorded at the Floating Jazz Festival aboard the Queen Elizabeth 2 in October of 2000. Phil Woods played and recorded with Kenny Dorham and Philly Jo Jones in June of 1956, before the "Whistle Stop" version was recorded. That session, called "Pairing Off," was recorded for Prestige by Rudy Van Gelder in Hackensack, NJ, before Rudy build his Englewood Cliffs studio. "Voyage" is drummer Willie Jones III first and only recording with Woods before his death in 2014. This session was bassist Peter Washington's second and final record date with Woods, his first being "The Rev And I," featuring tenorist Johnny Griffin. Out of the members of his trio, Charlap has recorded the most alongside Woods, credited on ten records with the acclaimed altoist. Willie Jones III Drum Transcription: A five-page detailed drum transcription of the way Willie Jones III played the in and out heads, including sticking patterns, comping samples entering the solo section, as well as his four-measure drum intro. The short syncopated phrases that make up the melody to Philly Twist show us why this tune was written for Philly Joe Jones; there's an art to filling cracks in the melody, and Philly Joe Jones mastered it. But other drummers have too! Our transcription shows Willie Jones III's graceful, dynamic accompaniment. Seeing the notes written out with sticking patterns will help you to play around the melody in a balanced way, creating your own fills. The intro in particular is a great example of fundamental, Max Roach-esque bebop drumming language. Phil Woods is an incredible player and this transcription will show you exactly how Jones comps for him during the first eight measures of his solo. Look no further than the first measure of Woods' solo for a great comping tool to add to your repertoire; Jones drops what is commonly referred to as a "bomb" on beat 4. CLIP Filling in the gaps of the melody with eighth notes, as we see Jones doing on this recording, propels the forward motion and intensity of the melody. To play along with this song or check out how drummer Vince Cherico plays Dorham's classic blues, get our Minus You version of Philly Twist, part of our "K.D. Challenge" (click the album cover above right). Also, check out our Drum Corner for more transcriptions by Willie Jones III and other masters. For this song, one of Dorham's most subtly intricate compositions, we have expanded our Minus You format to include three recordings at different tempos. The "Medium" version allows you to practice the head, drum shout chorus and the coda at a slower tempo (click on the Practice Tracks album cover) before moving on to the "Medium up" version (this one), which is around the tempo of the original Kenny Dorham recording. For the truly adventurous, there is also a somewhat faster "Uptempo" version, whose solo section consists of trading 4s with the drums (click on the"K.D. EXTRA Challenge" cover). This arrangement differs from the original by introducing an "interlude" section (C) before the solo choruses. Instead of going directly into the first solo after B at the fifth measure of a blues chorus, our C section consists of eight measures of stop-time with drum breaks (though again beginning on the fifth measure of a chorus). The "Medium" version does not have solo choruses; in this version the last two measures of C are a drum break leading into the drum shout choruses. All versions have two drum shout choruses followed by the out head. The last two measures of the coda are rhythmically slightly different in the "Uptempo" version. All these variations are indicated clearly in the Minus You parts. For this song as well as most other "K.D. Challenge" songs, we consider it important for the pianist, bassist, and drummer to know what else is going on around their parts. Accordingly, in all three rhythm section parts we have included the melody on a separate upper staff, as well as any notable figures below the lower staff that one instrument in the rhythm section has but another does not. Drummer Kenny Washington, a Kenny Dorham-Philly Joe Jones aficionado and expert, played this recently at NYC's Village Vanguard with the Bill Charlap Trio. The crowd loved it! The "Medium" version does not have solo choruses; in this version the last two measures of C are a drum break leading into the drum shout choruses. All versions have two drum shout choruses followed by the out head. This medium tempo version is ideal for learning the song. For this song, one of Dorham's most subtly intricate compositions, we have expanded our Minus You format to include three recordings at different tempos. This is the "Uptempo" version, whose solo section consists of trading 4s with the drums. All versions have two drum shout choruses followed by the out head. The last two measures of the coda are rhythmically slightly different in the "Uptempo" version. All these variations are indicated clearly in the Minus You parts. Try to keep up with this tempo!